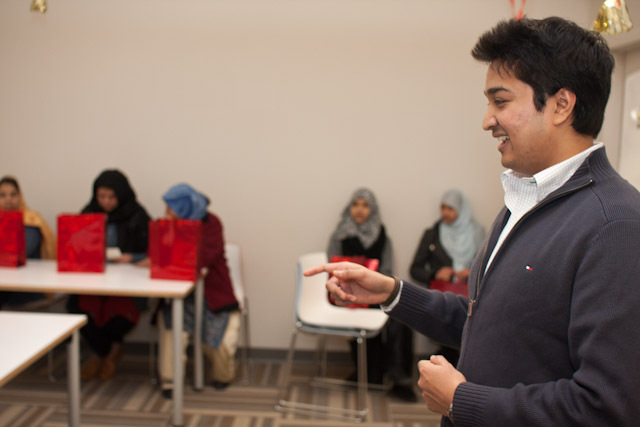 Mohammed Shafique, YEP’s founder, addresses the learners. YEP works like this: parents sign up to get free English and computer lessons from local youth, who themselves earn volunteer hours towards obtaining their high school diplomas. It’s an opportunity not only for the parents to learn valuable skills, but also for the youth to gain leadership experience and improve their own ability to communicate. It was inspired by Pathways to Education, a program created by the Regent Park Community Health Centre that, among other services, provides at-risk youth with bus tokens and post-secondary educational bursaries if they complete high school. Founder Mohammed Shafique experienced its benefits first-hand and so, as an alumni, he saw the potential for parents to learn from a similar model. He also thought the traditional model for ESL classrooms, where a group of adult learners are taught by one teacher at the front, could be improved. “It’s already happening in homes—youth have to tell their parents what the bill means, how to read the signs in the grocery stores—so why not create a formalized setting where the students are trained to teach their parents English and computers?” Shafique explains, adding that he and his team want to challenge the negative stereotypes about immigrant families in Regent Park. 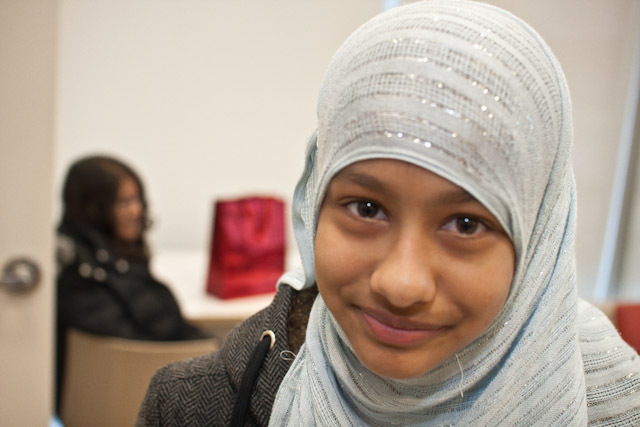 Hoore, an eighth-grader from Lord Dufferin Public School and a volunteer YEP instructor. Jahangir Bhatti (aka John), the analyst of the YEP team, says that the learning curve has been steep in their first term. “Not all the students know how to teach. They themselves can know what it means to read novels or search recipes on the internet, but to communicate that to another person—let alone an older generation—is not that easy.” True. Imagine teaching your grandma how to go online and submit a claim for her last prescription. “For the next semester, I want to develop a metric that allows us to assess how effective the learning has been for the parents,” Bhatti says. For both youth and parents, YEP offers a win-win experience. As a new organization, YEP is looking to gain momentum by hooking up with other community-based organizations. Shafique was proud to announce that they won access to a shared workspace from The Centre for Social Innovation‘s Annex location at Bathurst and Bloor starting this month. With access to both the facilities and a network of more than two hundred and fifty social change communities and projects, Shafique and his team are looking forward to rubbing shoulders with other agents of change in Toronto.